The mounting pressures of World War I, combined with years of injustice, toppled the rule of Tsar Nicholas II in March 1917. Forced to abdicate, he was replaced by a Provisional Government committed to continuing the war. and undermined the Provisional Government's authority. Capitalizing on this situation, the Germans secretly transported the exiled Vladimir Lenin in a sealed train from Switzerland to Russia in the hope he would enflame the turmoil. German expectations were realized on the night of November 6-7 when Lenin led the Bolsheviks in a successful attempt to grab the reigns of power in St. Petersburg. Anti-Bolshevik forces (the White Russians) immediately took up arms to oust the Communist regime and Russia was plunged into a brutal civil war. The following March the Communist regime signed a treaty with the Germans ending Russia's participation in World War I. Against this backdrop of political chaos, the Tsar and his family were initially kept as prisoners near St. Petersburg and then transported beyond the Ural Mountains finally ending up in the town of Ekaterinburg in the Spring of 1918. 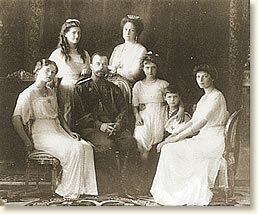 The seven members of the imperial family and their small retinue were confined to the house of a successful local merchant, N. N. Ipatiev, which had been commandeered by the Bolshevik's for this purpose. By mid-July a Czech contingent of the White Army was approaching Ekaterinburg and the sounds of gun fire could be heard in the distance by the royal prisoners and their Bolshevik captors. The arrival of their potential liberators sealed the fate of the Tsar and his family. During the early morning hours of July 17 the Tsar, his wife, children and servants were herded into the cellar of their prison house and executed. "We must shoot them all tonight." "In the evening of 16 July, between seven and eight p.m., when the time of my duty had just begun; Commandant Yurovsky, [the head of the execution squad] ordered me to take all the Nagan revolvers from the guards and to bring them to him. I took twelve revolvers from the sentries as well as from some other of the guards and brought them to the commandant's office. Yurovsky said to me, 'We must shoot them all tonight; so notify the guards not to be alarmed if they hear shots.' I understood, therefore, that Yurovsky had it in his mind to shoot the whole of the Tsar's family, as well as the doctor and the servants who lived with them, but I did not ask him where or by whom the decision had been made...At about ten o'clock in the evening in accordance with Yurovsky's order I informed the guards not to be alarmed if they should hear firing. About midnight Yurovsky woke up the Tsar's family. I do not know if he told them the reason they had been awakened and where they were to be taken, but I positively affirm that it was Yurovsky who entered the room occupied by the Tsar's family. In about an hour the whole of the family, the doctor, the maid and the waiters got up, washed and dressed themselves. Just before Yurovsky went to awaken the family, two members of the Extraordinary Commission [of the Ekaterinburg Soviet] arrived at Ipatiev's house. Shortly after one o'clock a.m., the Tsar, the Tsaritsa, their four daughters, the maid, the doctor, the cook and the waiters left their rooms. The Tsar carried the heir in his arms. The Emperor and the heir were dressed in gimnasterkas [soldiers' shirts] and wore caps. The Empress, her daughters and the others followed him. Yurovsky, his assistant and the two above-mentioned members of the Extraordinary Commission accompanied them. I was also present. first floor, we went out into the court, and from there to the second door (counting from the gate) we entered the ground floor of the house. When the room (which adjoins the store room with a sealed door) was reached, Yurovsky ordered chairs to be brought, and his assistant brought three chairs. One chair was given to the Emperor, one to the Empress, and the third to the heir. The Empress sat by the wall by the window, near the black pillar of the arch. Behind her stood three of her daughters (I knew their faces very well, because I had seen them every day when they walked in the garden, but I didn't know their names). The heir and the Emperor sat side by side almost in the middle of the room. Doctor Botkin stood behind the heir. The maid, a very tall woman, stood at the left of the door leading to the store room; by her side stood one of the Tsar's daughters (the fourth). Two servants stood against the wall on the left from the entrance of the room. The maid carried a pillow. The Tsar's daughters also brought small pillows with them. One pillow was put on the Empress's chair; another on the heir's chair. It seemed as if all of them guessed their fate, but not one of them uttered a single sound. At this moment eleven men entered the room: Yurovsky, his assistant, two members of the Extraordinary Commission, and seven Letts [operatives of the infamous Cheka or Secret Police]..
Yurovsky ordered me to leave, saying, 'Go on to the street, see if there is anybody there, and wait to see whether the shots have been heard.' I went out to the court, which was enclosed by a fence, but before I got to the street I heard the firing. I returned to the house immediately (only two or three minutes having elapsed) and upon entering the room where the execution had taken place, I saw that all the members of the Tsar's family were lying on the floor with many wounds in their bodies. The blood was running in streams. The doctor, the maid and two waiters had also been shot. When I entered the heir was still alive and moaned a little. Yurovsky went up and fired two or three more times at him. Then the heir was still." Medvedev's account appears in: Wilton, Robert, The Last Days of the Romanovs (1920); Massie, Robert, The Romanovs, the Final Chapter (1996); Massie, Robert, Nicholas and Alexandra (1967). 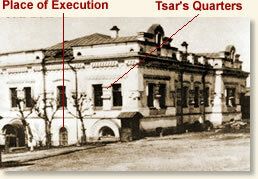 "The Execution of Tsar Nicholas II, 1918," EyeWitness to History, www.eyewitnesstohistory.com (2005). The pillows carried by the women were later found to be filled with diamonds, pearls and other precious jewelry. In addition to the imperial family, the executed included: their doctor, cook, valet, maid and dog. 8 days after the executions, the town of Ekaterinburg was captured by the White Army.